Forgetting Windows password seems as a universal nightmare among Windows users. Fortunately this scary situation is not need to be scared anymore because nowadays anyone can create a Windows Password Reset CD after forgot windows password. A Windows password reset CD is a bootable disk used to reset windows local password and gain access to a locked windows-based computer if you forget windows password. This article mainly explains you how to burn a Windows password reset CD with SmartKey Windows Password Recovery Standard. 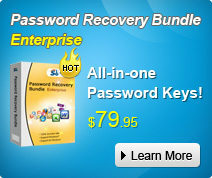 Make sure you have download SmartKey Windows Password Recovery Standard and install it. Before you purchase this software, you may firstly download a free demo version to test. This is the overriding procedure, please read carefully. Run Windows Password Recovery Standard. At choose the recovery mode panel, select “Reset Windows local account password – Word with regular user accounts”. NOTE: if you choose “Reset Windows domain password” a NOTE window will pop up and notice you that Windows Password Recovery Standard 6.0 can only rese Windows local account password, if you want to reset Windows domain password, you should upgrade to Windows Password Recovery Enterprise 6.0. Insert a CD/DVD disk into the CD-ROM drive and then choose your CD/DVD path from the pull-down list of the CD/DVD options. Click Burn to start the bootable disk creation procedure. When burning successfully completed, click OK.
Insert newly burned CD/DVD into your locked computer and reboot your computer. Note: you should set BIOS booting from the CD/DVD-ROM before reboot your PC with a CD/DVD disk. When the CD/DVD boots, you’ll see SmartKey Windows Password Standard 6.0 initializing, then select the user account whose password you have forgotten. Click “Reset” to begin the password reset process, and then Yes to confirm your choice. After Password of administrator has been reset message box appears, click “OK” to finish your steps. If you are not satisfied with our new product Windows Password Recovery CD for any reason, Please E-mail to us and we will fix the problem and response to you as soon as possible. How to Create a Windows Password Reset Disk?